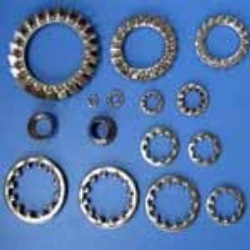 Providing you the best range of serrated lock washers with effective & timely delivery. IS 5556 A Externally Toothed Serrated Locked Washers generally manufactured in materials spring steel, Mild steel, stainless steel, Phosphorous Bronze etc. for use in screws. Can be manufactured in different materials as per the specifications/requirement/drawings or samples given by you. IS 5556 B Internally Toothed Serrated Locked Washers generally manufactured in materials spring steel, Mild steel, stainless steel, Phosphorous Bronze etc. for use in screws. Can be manufactured in different materials as per the specifications/requirement/drawings or samples given by you. IS 5556 C Countersunk Serrated Locked Washers generally manufactured in materials spring steel, Mild steel, stainless steel, Phosphorous Bronze etc. for use in screws. Can be manufactured in different materials as per the specifications/requirement/drawings or samples given by you. Looking for Serrated Lock Washers ?